You are here: Home / WordPress Tutorial For Beginners / How do I change the Site Title and Tagline? 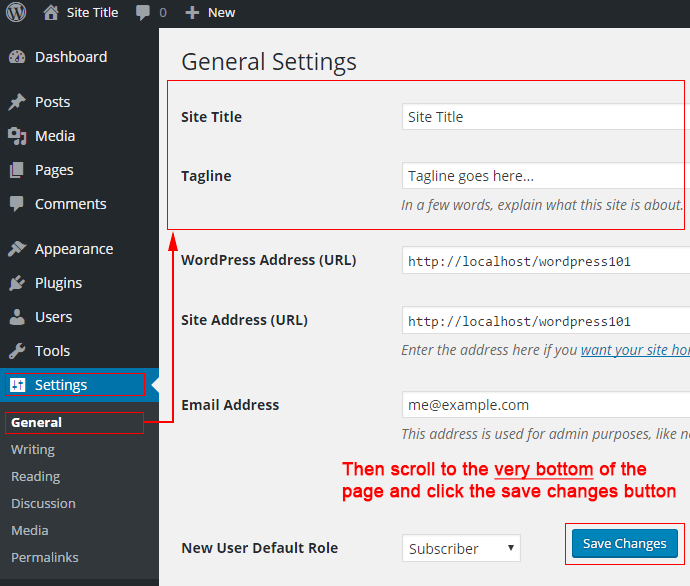 WordPress makes it easy for you to display your Site Title and tagline prominently at the top of your site. 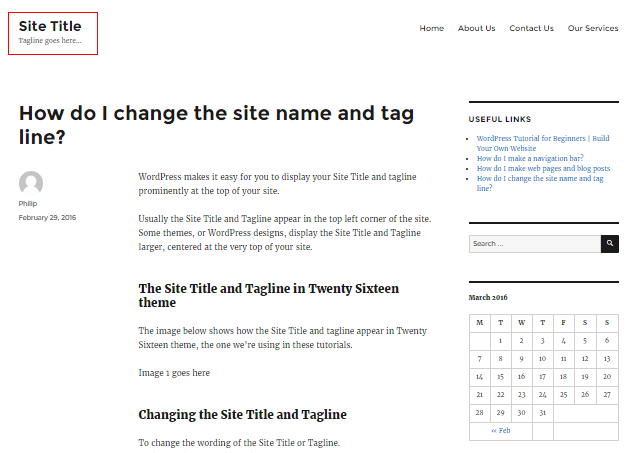 And you can change the site title and tagline with just a few clicks. Usually the Site Title and Tagline appear in the top left corner of the site. Some themes, or WordPress designs, display the Site Title and Tagline larger, centered at the very top of your site. The image below shows how the Site Title and tagline appear in Twenty Sixteen theme, the one we’re using in these tutorials. To change the wording of the Site Title or Tagline. At the very top of the Settings General page there are two text boxes. One for the Site Title and one for the Tagline. Just type your own Site Title and Tagline in the boxes, then scroll down the page and click the big blue Save Changes button. You’ve now changed the site title and tagline. You can find more info at the WordPress Codex. There are thousands of themes, or web designs for WordPress. Some of these themes do display the Tagline, some don’t. Check the documentation for your theme to find out. Can you add an image logo? 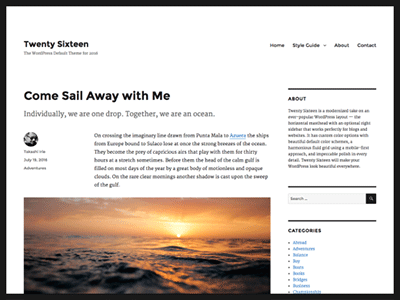 Some themes, or WordPress web designs, allow you to swap the Site Title and Tagline for an image logo. You could also check the documentation for your theme to find out more about the customization options that are available for your theme. In the Twenty Sixteen theme, the theme I’ve been using in these tutorials, you can NOT replace the Site Title and Tagline with an image logo. But you can add a large header banner image near the top of the site. If your theme does not allow you to put the logo in the top left of your site, you could put the logo in the page text, just like any other image. You could also put your logo in the sidebar. However, when someone visits your site using a smart phone, the sidebar is displayed after the main article or page. So smart phone users would have to scroll quite a long way to see your logo if it’s in the sidebar. Previous Post: « How do I change the look or design of my WordPress website?